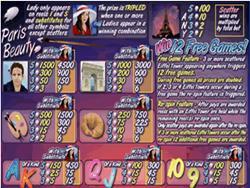 Paris Beauty Slot Information, Screenshots and which online casinos offer Paris Beauty Slot for Play. Paris - The home of glitz and glamour! 5 Reel 20 Payline Video Slot video featuring Free Spins, Multipliers and a Progressive Jackpot. The theme of this game all about the romantic city Paris, with wine, love and beautiful women. Be inspired by the city that has featured in many movies, poems and novels with all the well known landmarks. Eiffel Tower, Arc De Triumph, Chic Lady, Artist, Colour Palette, Paint Brush, Croissant, Ace, King, Queen, Jack, Ten and Nine. Play from a minimum of 0.01 up to a maximum of 5.00 and select up to 20 paylines. Any bet can also land a random progressive jackpot! The Lady Wild symbol substitutes for other symbols to complete a winning combination. The Wild also triples the win when appearing in a winning combination. 2 Scatter symbols award a scatter payout, or a win up to 100x the total bet with scatters appearing. Win 12 free spins at a 2x multiplier when 3 or more Eiffel Towers appear anywhere on the reels. During the free spins round all prizes will be doubled. When 2, 3 or 4 Eiffel Tower symbols appear during the free spins a re-spin feature will be activated. The Progressive Jackpot is triggered at random and can be won with any spin. The Jackpot wins get added to all other wins. 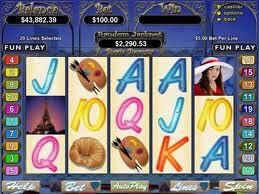 Paris Beauty Slot has attractive graphics, interesting sound effects and is easy to play.